Deb's Cup of Tea: So you don't have to. These have been advertised for several months in my Cooking Light magazine. I have tried to find them every time I go to the grocery but they didn't carry them. I went to Target today and, as I was headed to the checkout, there they were. $2.79 for a box. Don't waste your money. Seriously. There is cheddar on the crackers to be sure, but if, like me, you like the taste of cheese, these are not the crackers you want to get. In fact, you'd be better off buying a plain or wheat cracker and a chunk of cheddar if you want cheddar crackers. I decided, half-way through, that these weren't getting any better so I put them out for the wildlife. You're welcome. Save your $2.79 for milk or eggs and flower or a really nice farmer cheddar. 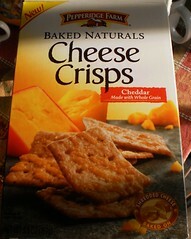 I agree the cheddar version of these leaves something to be desired, but the 4 cheese cheese crisps are pretty good.